•	Modern coverage of the Short Run. Macroeconomics uses a logical, straightforward short-run model that more accurately describes Fed behavior in the 21st century: IS/MP. Plus, Macroeconomics includes expanded coverage of the micro foundations of macro. •	Modern coverage of the Long Run and Growth. Macroeconomics presents modern growth theory as researchers in the last 25 years understand it, with complete, accessible coverage of the Romer model (the foundation of modern growth theory) and more accurate and appropriate presentation of the Solow model. •	Worked Exercises walk students step-by-step through solutions to select end-of-chapter exercises. •	Even more problem-solving help with SmartWork. Fully editable and customizable, SmartWork guides students through problems from each chapter with Smart feedback. The Great Recession is the most important economic event since the Great Depression. 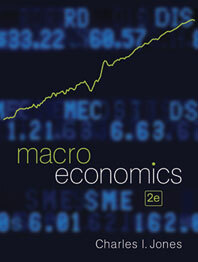 Macroeconomics treats it with the importance it deserves, with up-to-date examples throughout the text and two complete chapters on the crisis and its impact. •	Chapter 10 is an overview of the events of the crisis, discussing at length the collapse of the housing market in the United States, the world savings glut, subprime lending, the packaging of mortgage-backed securities by the major investment banks, and the beginning of the current recession. The final section of this chapter presents important discussions on bank balance sheets and the role that leverage has played in the crisis; it concludes by describing the bank runs that beset the financial system in the first months of the crisis. •	Chapter 14 takes the fundamental information presented in Chapter 10 and then analyzes the economic crisis using the short-run models used in the text—IS/MP and Aggregate Supply/Aggregate Demand. The key innovation is the addition of a “risk premium” to the IS/MP and Aggregate Supply/Aggregate Demand models that explains the devastating separation that has occurred between the interest rate set by the Fed and the interest rate being charged in the economy itself. This chapter also discusses the dangers of deflation, policy responses to the crisis, monetary policy, money supply, the Fed’s balance sheet, how to repair the financial system, and the fiscal stimulus program. Macroeconomics has greatly expanded its coverage of financial markets and fiscal policy, especially in the new chapters on the crisis. Also, the text has two new chapters, one on consumption and the other on investment, both of which reflect Chad Jones’s modern view of macroeconomics.